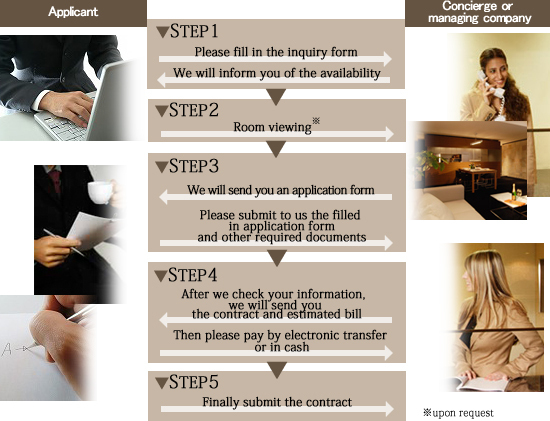 For general inquiries, simply fill in and submit the Service Apartment Ebisu Inquiry Form. Open on Mondays, Tuesdays, Wednesdays, Thursdays and Fridays from 9:00 am to 6:00 pm. *Inquiries made after hours, Saturdays, Sundays, and national holidays will be processed the following operation. If you would like to see the actual room, please make a reservation or visit the reception desk on-site directly. Once an empty room is confirmed, we will send you an application form. Make sure you fill out the required information, and return the form to us together with the necessary documents. Upon receiving your application complete with the necessary documentation, we will conduct a simple predetermined screening procedure. The screening procedure takes about 3 days to 1 week to complete. We will contact you after the screening procedure is complete, and you are then required to pay advance room charges and a guarantee deposit to the designated bank account. You must sign and seal the contract with your personal seal. *In general, you will not be charged for any restoration fees. A month rent cancellation fee will incur. Remaining balance of the rent will be charged as a cancellation fee.